Published: April 28, 2011 at 06:25 p.m.
Thirty-two young men will have their dreams come true during the first round of the NFL draft Thursday night. And because the green room has not always been so kind to players in the past, I admire the courage of those in attendance at Radio City Musical Hall to be part of it. Do you need to be reminded about Aaron Rodgers falling down the draft board in 2005? 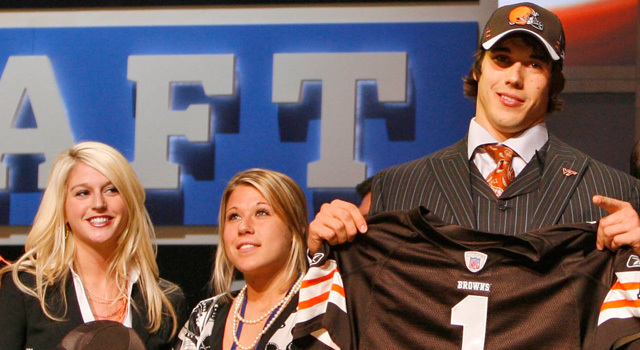 Or what about Brady Quinn in 2007? Well, things worked out well for Rodgers who went on to become Super Bowl MVP this year. And Quinn, well, that chick you were with during the draft was rather attractive, so good for you, too. Have you ever been to an Applebee's overrun by children acting like Rugrats while you're trying to enjoy your food? That is what I would imagine a draft-day green room experience with Cromartie and his brood would be like. The enigmatic receiver seems to need constant validation. A few moments of silence after getting passed up, and Ochocinco would likely turn into an insecure girlfriend: "Are you mad at me?" "Did I do something wrong?" "Why does nobody want me?" The best case scenario here would be that Ochocinco have his head buried in his BlackBerry, tweeting to the world. Ever sit next to somebody at a movie who you have to explain every plot point to? I would imagine that is what it would be like next to McNabb during the draft -- seeing that he's not too keen on the current NFL rules. Seriously, if he couldn't figure out overtime, try explaining why these teams get 10 minutes between each picks. Imagine trying to make small talk with Belichick. Hey Bill, howâs it going? âFine.â Draft day is exciting, right? âSure.â How about that weather? âUh huh.â Three questions in, and you're already using the weather to break the ice. And seriously, Bill, this is a huge night. Do you think you could dress up a just a little? The hoodie seems a tad out of place. Everybody knows that spoiled brat who throws a tantrum when he doesn't get his way. Well, that's exactly what Eli Manning did when the Chargers drafted him No. 1 overall in 2004. Who wants to be stuck in a room when Eli goes into Veruca Salt mode on Archie? "But I don't want to go to San Diego, daddy! Whaaaaaaaaaa!" The worst part is that most people would kill to live in San Diego. Imagine you sitting in the green room. You are with your family. In your finest suit. You hear the commissioner call your name, which has you beaming with pride as you walk to the podium. Then, all of a sudden, the Jets' strength coach trips you during your big moment. Man, that guy is a (expletive). "Pick Six: The NFL's royal family..."